The plant cell and the animal cell can be differentiated by the presence of organelles in them. Although both are classified as Eukaryotes, the presence of the cell wall, vacuoles, and chloroplasts are the most remarkable and distinguishing components of the plant cells which are absent in the animal cells. Even the size of the animal cell is smaller than the plant cell. The concept of cell originated from the historical work done by the Schleiden and Schwann in 1838. Cells exist in an amazing variety of sizes and shapes. Likewise the living beings, the individual cells that form the body can grow, reproduce, process information, as well respond to stimuli. Despite the differences among different kinds of the cells whether it is plant cell or animal cell, single celled or multi cell, they all share certain common features and carry out different complicated process in the almost same way. The multicellular organisms contain billions or trillions of cells organized complexly, while unicellular consist of the single cell only. But even that single cell organisms will define itself by exhibiting all the remarkable properties that a cell needs to become a fundamental and structural unit of life. In this content, we will take-up the salient features of the plant cells and animal cells and how they differ from each other. Meaning The fundamental and functional unit of Kingdom Plantae of the Eukaryotic cells, having true nucleus along with the many organelles, specially the cell wall, chloroplast and the vacuoles. Animal cells are also the basic unit of life of Kingdom Animalia of the Eukaryotic cells, having all the necessary organelles with specified functions. Cell Size Usually larger, which is fixed. Smaller in size and irregular. Enclosed by A plant cell is enclosed by rigid cell wall along with the plasma membrane. The animal cell is enclosed by a flexible, thin plasma membrane only. Nucleus Present and lies on one side of the cell. Present and lies in the centre of the cell wall. Plastids Present with chloroplast in them. Plastids are absent. Glyoxysomes May be present. Absent. Mitochondria Present in fewer number. Present in large number. Vacuoles Only one huge vacuole. Animal cells contain many in numbers. Lysosomes Rarely noticed in plant cells. Present. Chloroplast Plant cell contains chloroplast, which they use in storing energy. Animal cells lack chloroplast and use mitochondria for energy storing purpose. Reserve food Present as starch. Present as glycogen. Synthesis of nutrients They can synthesize all amino acids, vitamins and coenzymes. They are not able to synthesize any amino acids, vitamins and coenzymes required by them. Cytokinesis Occurs by cell plate only. Occurs by furrowing or constrictions. Hypotonic/Hypertonic Solutions Plant cell does not burst if placed in hypotonic solution. Animal cells burst in hypertonic solution as they do not have the cell wall. Mainly Kingdom Plantae consists of multi-cellular eukaryotes living things, which are autotrophic by nature. As we discussed above that the organelles in plant cell like – chloroplast, cell wall, and vacuoles distinguishes them from the animal cells. Till yet around 400,000 number of plants species have been identified, and there is the lot remain undiscovered. Normally the range of plant cells varies from 10-100 µm in size. Plant cell carries out the function of photosynthesis, due to which the green plants are called as autotrophs. This is done by the presence of chlorophyll in the chloroplast of the plant cells. The cell wall is made up of cellulose, which provides support and rigidity to the cells. Plasma Membrane – It controls the movement of the molecules in and out of the cell and function in adhesion and signaling also. Cell Wall – The cell wall is usually rigid, non-living and permeable component surrounding the plasma membrane. They are two types: The primary cell wall and the secondary cell wall. The primary cell wall is made up of cellulose and is formed at the time of cell division. The secondary cell wall is made up of lignin and cellulose and helps giving shape and size to the cell. Chloroplasts – This is the unique features found in plant cells, which help in the preparation of the food at the site of photosynthesis. Plastids are the term used collectively to represent chloroplasts (green plastids containing chlorophylls), chromoplast (yellow to reddish color plastids) and leucoplast (colorless plastids). Chloroplast contains the other parts like thylakoids and stroma, which helps in capturing sunlight, helping in the synthesis of food. Vacuoles – Vacuoles occupy 90% of the total cell volume. These are the membrane-bound, liquid filled vesicles. Vacuoles contain the high range of dissolved salts, sugars, pigments and other toxic waste. They also provide physical support and contribute in giving color to the leaves and the flowers. 1. Parenchyma – These are the structurally simplest cells, and have thin walls. They are used for storage of organic products. 2. Collenchyma – These have thin walls, with thickening at some parts of the cell. These cells provide structural support to the cell. 3. Sclerenchyma – The cell wall of this cell are embedded with lignin. 4. Water Conducting Cells – The vascular tissue in plants known as Xylem, helps in transmitting water from roots to other parts of the plants. 5. Sieve Tube Members – The another plant tissue known as Phloem, helps in transporting food and nutrients. This (food) is prepared in the green leaves by the process of photosynthesis. The three-fourth part among all the species is taken by the Kingdom Animalia on the planet. The human body is composed of 1014 cells, whose size varies from 10-30 µm in diameter. Animal cells do not have cell wall and chloroplast which mainly distinguish them from the plant cells. It is believed that cell wall disappeared with the evolution and the animal cells developed with the more advanced cells, tissues, and organs which are more specified in their function. Nerves and muscles are such kinds which help in locomotion, mobility and in performing other functions too. Plasma Membrane – As discussed above that it controls the movement of the molecules in and out of the cell and function in cell-cell signaling and cell adhesion. It is the outermost layer of the cell and the protect the internal organelles also. Mitochondria – It is called as ‘the powerhouse of the cell’ as ATP (adenosine triphosphate) is generated by oxidation of glucose and fatty acids. Lysosomes – It has the acidic lumen which degrades material engulfed by the cell, and worn out cellular membranes and organelles. They are regarded as the digestive tract of the cell. Nuclear envelope – This is the double layer membrane, protecting the contents of the nucleus. Nucleus – It contains the hereditary material and is filled with chromatin made up of DNA and proteins. Endoplasmic reticulum (ER) – It is of two types Smooth endoplasmic reticulum and Rough endoplasmic reticulum. In Smooth endoplasmic reticulum, lipids are synthesized, and detoxification occurs of the hydrophobic compounds. In Rough endoplasmic reticulum protein synthesis, processing takes place. Golgi Complex – This organelle processes and sorts lysosomal proteins, secreted proteins and membrane proteins synthesized on the rough endoplasmic reticulum. Secretory vesicles – It stores secreted proteins and fuse with the plasma membrane to release their content. Peroxisomes – Also known as microbodies and are the single membrane cellular bodies. They are oval or spherical and contain the enzyme catalase. Peroxisomes detoxify the molecules and break down the fatty acids to produce acetyl groups for biosynthesis. Cytoskeletal fibers – It forms the network and bundles that support cellular membrane, and help organize organelles and supports the cell movement. The cellular matrix is collectively referred to as cytosol. The cytosol is a compartment containing several metabolites, enzymes, and salts in an aqueous gel like the medium. Microvilli – It increases the surface area for absorption of the nutrients from surrounding medium. 1. Skin Cells – These are found in the dermal and epidermal layer, the skin works in the protection of the internal parts, prevent the excess loss of water through dehydration, perception and in the transmission of sensation. 2. Bone Cells – Bone cells are responsible for making bones and skeleton of animals. There are many types of bone cell, and the primary function is to provide the structural support and helps in the movement of the body. 3. Muscle Cells – Muscles cells or myocytes functions for the movement of the body. They also help in the protection of the delicate organs of the body. 4. Blood Cells – They work as the transporter in the body which carry hormones and nutrients. Mainly the blood carries oxygen to different tissues of the body and also helps in taking back the carbon dioxide from them. Blood cells are also known as hematopoietic cells. 5. Nerve Cells – These are specialized cells, appointed to send impulses or information. These are signals or messages help the body to connect and perform the function in the synchronized manner and according to the outer environment. These electrochemical signals are sent from central nervous system and the sensory receptors. The fundamental and functional unit of life – The Cell, which can be prokaryotic or eukaryotic, single celled or multi-celled. But eukaryotes are further divided as Kingdom Plantae and Kingdom Animalia.These are the types of multicellular, Eukaryotic cells, having many features common but plant cell possess certain other organelles such as the cell wall, chloroplast, and the vacuoles. These organelles are found to be absent in animal cells. The Plant Cells are usually larger, which has fixed and rectangular shape, while animal cells are comparatively smaller in size, irregular and round. cell wall, but plasma membrane is present. The nucleus is present in both the cells, but in Plant cell it lies on one side while it is present in the center of the Animal cell. Centrosomes/Centrioles, Cilia, Desmosomes, Lysosomes are the organelles found absent in Plant cells, while they exist in Animal Cells. Plastids, Glyoxysomes, Plasmodesmata, Chloroplast (for the preparation of food) are the features present in the Plant Cells but not found in Animal cells. There is a huge vacuole present in Plant cells, but numerous and small vacuoles are present in Animal Cells. Mitochondria if present is fewer in number, though they play a significant role in Animal Cells and are present in numbers. In Animal Cells they help in the production of energy. The storing of energy is done by Chloroplast in Plant cells, which is absent in Animal Cells. The reserve food material is Starch in Plant Cell and Glycogen in Animal Cells. Synthesis of nutrients like amino acids, vitamins, and coenzymes is performed by the Plant cells, but Animal Cells are unable to do so. Cytokinesis occurs by cell plate only in Plant Cells whereas in Animal Cells it occurs by furrowing or constrictions. Plant and Animal cells are are eukaryotic cells. The both have the cell membrane. Well- defined nucleus is present. Both the cells contain Golgi apparatus. One of the most important parts of the cell is the Cytoplasm, which is also the present in both. Ribosomes are also found in both the plant cells and the animal cells. 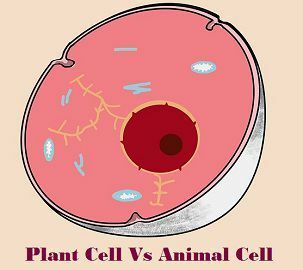 In this article, we discussed the plant cells and animal cells and their types, and the essential points which distinguish them. We conclude that all eukaryotic cells whether it is a plant cell or animal cell contain the nucleus and few organelles in common along with similarities in their function, except the few. The reason for this difference can be the mode of nutrition as plant are said as autotrophs, while animals are the heterotrophs. Another reason can be the evolution which took place and thus the cells developed according to the needs.